Sometimes logic is overrated. You could seek out a video game that’s grounded in reality with deep characters and a compelling narrative, but sometimes you just want to dress up like Sauron from Lord of the Rings and hit something with a giant lightning axe. For times like this, there are games like Dead Rising 4. In Dead Rising 4, you play Frank West, professional journalist and protagonist from the original Dead Rising game. Frank teaches journalism at a university now, and one of his students ropes him into investigating a secret government facility with some decidedly shady stuff going on. Of course, it doesn’t take long for a zombie outbreak to occur, and Frank West is the only man for the job. The story of Dead Rising has never really mattered as much as the gore, ridiculous characters, and banter, and Dead Rising 4 is no exception. Though the story has its twists and turns, and ultimately comes to a pretty unexpected conclusion, the story largely serves as a backdrop for one-liners, and dismemberment. True to this philosophy, Frank West is sarcastic, blithe, and completely apathetic to the narrative developments, every step of the way. This approach pays off in a big way with Dead Rising 4, thanks to some truly spectacular writing, and top-notch voice acting. With so many zombie games taking a serious approach to storytelling, it’s refreshing to have a protagonist rolling his eyes, and nearly shattering the fourth wall with his apathy. 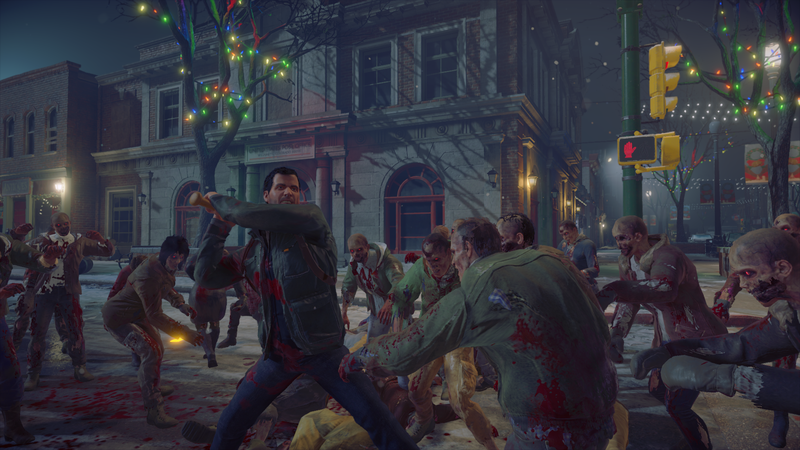 The setting for Dead Rising 4 is Willamette, which was also the location that Frank found himself in the original Dead Rising game, but this time he’s not confined to the walls of the mall. Instead, Frank is free to roam about in the largest map that the series has seen so far. While Willamette has certainly seen better days, there is an unmistakable charm to the Chistmas decoration slathered, zombie infested suburbs. Festive music plays loudly throughout the town, and Santa ornaments smile at you on every corner, while insane survivors fight off hordes of zombies in the streets. It’s a perfect mix of horror, and felicity that Dead Rising is so known for, making it without a doubt my favorite setting in recent memory. Dead Rising 4 is all about killing zombies by the thousands in the most ridiculous ways imaginable. At your disposal are hundreds of melee weapons, vehicles, guns, explosives, and improvised weapons, since nearly any item can be used to fuel your killing spree. Even more deadly, though, are Frank’s insane weapon and vehicle combinations that he creates by combining two items. You’ll find yourself spitting fire out of a triceratops mask, plowing through enemies in an electrified golf cart, and calling forth armies of ice gnomes using a festive staff. Silly weapons and over-the-top gore have always been hallmarks of the series, and Dead Rising 4 continues this tradition. There are plenty of unlockables and resources to aid Frank in his slay ride. Schematics are scattered about Willamette, which teach Frank how to create new deadly combo weapons/vehicles. Skills are unlocked regularly, which make Frank more powerful and more efficient. Frank can also gain access to new vendors, and more resources by rescuing survivors, and building up the strength of various emergency shelters scattered throughout Willamette. I became addicted to seeking out every schematic in the game, so that I could enjoy Dead Rising 4’s wide range of Frankenstein-like combo weapons, and vehicles. Leveling up can also be invaluable, and happens constantly thanks to the generous helpings of PP, or “power points,” that are given to you as you shoot, slash, and kick your way through Willamette. Dead Rising 4 is the best game in the series, even though it only marginally improves a lot of mechanics that were introduced with Dead Rising 3, and in a lot of ways the former feels like a continuation of the latter. Anyone who played Dead Rising 3 will feel extremely familiar with the mechanics, feel, and look of Dead Rising 4. The biggest change is that, for the first time in the series, you will no longer have to worry about deadlines. That’s right–there is no timer telling you where to be, and reminding you of your various responsibilities along the way. You can murder to your heart’s content, and get around to doing the campaign when you feel like it, which is a huge relief. This entry also manages to make some pretty major improvements when it comes to technical performance. Dead Rising 3 was a launch game on the Xbox One, had a framerate that was oftentimes unstable, and was chock-full of various sandbox glitches. While Dead Rising 4 has its issues, it performs far better than its predecessor. The framerate is smooth as can be, which is especially impressive given how ambitious the game is with the amount of zombies on-screen at the same time. Unfortunately, Dead Rising 4 did give me a bit of trouble in the way of glitches, one of which was particularly troublesome. About 3/4ths of the way through the campaign, all of my emergency shelters were suddenly empty, meaning that all of the people I saved had disappeared. This didn’t break the game, and I was able to complete the story and do pretty much everything that I wanted, but I was unable to purchase things from vendors, which was a bummer. Something that I wish Dead Rising 4 did better are boss fights. Boss fights have always been a major part of Dead Rising, and sadly, bosses play a much smaller role in this entry. There are boss fights, but all of the optional ones are small encounters that don’t come with their own cutscenes, as we’ve had in the past. The boss fights that happen as part of the main story are much stronger, but it’s a little disappointing to see the role of boss fights minimized. The Dead Rising series has never looked amazing, and Dead Rising 4 is no exception, but it is at least the best looking one so far. Character models are lifelike, and gore is detailed (in some cases a little too much so). That said, this isn’t a game that will impress anyone with its visual presentation. The sound design, on the other hand, is incredible. Sound effects are hilarious and larger-than-life, perhaps best demonstrated by the silly sounds that come from weapons. The Blambow (a crossbow that shoots fireworks), generates joyous pops when fired at enemies, and the ornament gun ( a cannon that fires Christmas tree ornaments) emits the sound of jingling bells from its explosions. The soundtrack is also great, particularly the sarcastic Christmas music that plays whenever the player enters the pause menu. Dead Rising 4 also adds a multiplayer campaign, which consists of four episodes, and its own dedicated character/leveling system. Four players are tasked with completing various tasks such as disarming bombs placed throughout the area, surviving hordes of zombies, and defeating bosses. The players level up as they go and, though it is a cooperative mode, compete for experience points, equipment, and PP along the way. The over-the-top style of Dead Rising lends itself extremely well to multiplayer, and I had a good deal of fun here, although it mostly feels like a smaller-scale version of the main game, with some added buddies. Zombies have gone from a nightmarish alternate reality portrayed in horror films, to a comedic device delighting in total excess and pure ridiculousness. Dead Rising 4 is my first rodeo with Capcom’s zombie apocalypse action series and, while I knew it was in the latter category, I didn’t expect to laugh as much as I did. The story’s protagonist, Frank West, is one of the most hilarious main characters I’ve encountered in video games, right up with there with Borderlands 2’s Handsome Jack. His jokes, bravado, wit, and near-complete apathy in the face of a dangerous zombie outbreak and groups of maniacal foes never get old and are a perfect complement to Dead Rising 4’s over-the-top formula. Speaking of over-the-top, facing off against hordes of zombies using all manner of comically impossible weaponry never loses its appeal. The weapon and vehicle combinations are both brutal and hilarious, providing plenty of opportunities to get creative with your zombie butchery. Riding through an infested shopping mall on an electric wheelchair modified with a cattle prod, driving a lawn mower combined through a group of deranged survivors who seem to think they’re part of some ultra-real LARP session are just a taste of what this game offers. Playing on the PC, however, I did encounter a great deal of jittery sequences. Running a GTX 1070 and an i5 6600K should be more than enough to achieve buttery smooth gameplay. Just in case, I turned visual settings down to “high,” and then even further to “medium,” but neither change made a difference, unfortunately. The voice acting, although decent, was poorly synced with the characters as well. If need some corpse-clearing Christmas catharsis, look no further. Dead Rising 4 is its own, particular brand of crazy. However, I’d recommended trying it on console if you’ve got the option. Dead Rising 4 is bloody, chaotic, and downright hilarious. If you’re looking to turn your brain off this holiday season, and destress with gratuitous violence, this is the game for you.